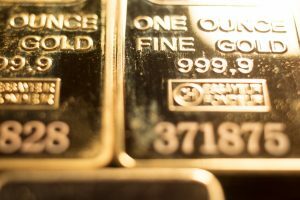 Gold: Will rally continue after Fed statement? Gold continues to gain ground this week. In Wednesday’s North American session, the spot price for one ounce of gold is $1308.82, up 0.37% on the day. On the fundamentals front, consumer inflation numbers were mixed. CPI was stronger than expected, with gain of 0.4%, above the estimate of 0.3%. Core CPI remained steady at 0.1%, shy of the estimate of 0.2%. Later in the day, the FOMC releases the minutes of the March policy meeting. On Thursday, the U.S. releases PPI and unemployment claims. Gold has enjoyed a strong week, with gains of 1.3 percent. The metal is sensitive to interest rate moves, so the Fed minutes from the March meeting should be treated as a market-mover. At the meeting, the Fed said it would start tapering the reduction of its balance sheet in May. This marks a loosening of policy, and comes in response to weaker economic data out of the U.S. in recent months. If the Fed continues its dovish tone in the minutes, risk apprehension could climb and boost gold prices. The U.S. labor market has been a bright spot, but recent employment numbers have slipped. JOLTS Job Openings dropped sharply to 7.09 million, down from 7.54 million in the previous release. The weak reading came on the heels of key employment numbers in March. Wage growth gained just 0.1%, while nonfarm employment payrolls came in at 196 thousand, lower than recent readings which broke above the 300-thousand level. With the labor market losing some its luster and the U.S. economy showing signs of slowing down, gold has taken advantage and pushed above the symbolic $1300 level earlier in the week.